On a Windows 10 computer the process "ShellExperienceHost" causes CPU high usage. The ShellExperienceHost.exe process with description "Windows Shell Experience Host", is part of Windows Operating System and the executable file is located at "C:\Windows\SystemApps\ShellExperienceHost_cw5n1h2txyewy" folder. The "ShellExperienceHost" app is responsible for the start menu in Windows 10, but sometimes the app hangs and the Start menu is not working or consumes many CPU resources even when the system is idle. In this tutorial you will find instructions to resolve "ShellExperienceHost.exe" high CPU (or Memory) usage problems or to resolve the Start menu not working (or freezing) issues on Windows 10. How to FIX: ShellExperienceHost.exe 100% CPU Usage and Start menu problems in Windows 10. Method 1. Scan your system for Viruses and Malware. The first step to resolve the “Windows Shell Experience Host” high CPU usage problem, is to ensure that your system is virus/malware free. For that task follow the instructions in this guide: How To Scan Your Computer for Viruses and other Malicious Programs. Method 2. Re-Register the Windows Shell Experience Host App. 1. Open PowerShell as Administrator. Method 3. Re-install Shell Experience Host package for the user account. 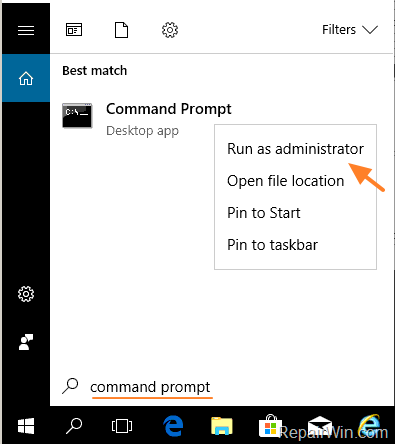 Right-click at Command Prompt result and select Run As Administrator. 2. 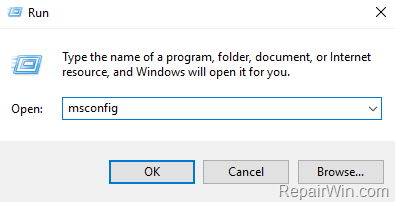 At command prompt type the following command to enable the hidden “Administrator” account and press Enter. Press the Windows + R keys to open the run command box. 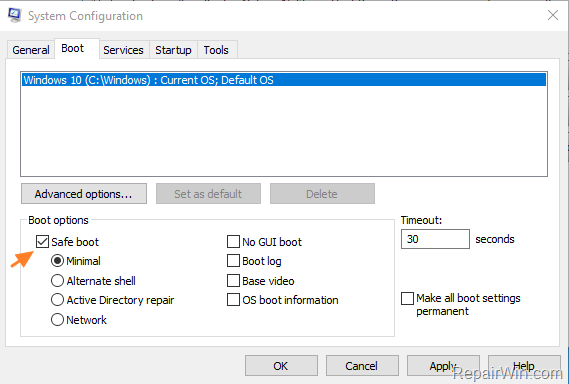 At Boot tab select the Safe Boot option, then click OK and restart your computer. 5. After restart, Sign-Out from the current user and login as Administrator. 6. Open Windows Explorer and navigate to C:\Users\%Username%\AppData\Local\Packages\ folder. 7. Rename the "Microsoft.Windows.ShellExperienceHost_cw5n1h2txyewy" folder to "Microsoft.Windows.ShellExperienceHost_cw5n1h2txyewy.BAK"
At General tab select the Normal startup option, then click OK and restart your computer. Method 4. Repair Windows 10. The final method to resolve the ShellExperienceHost.exe poblems, is to repair Windows 10 with In-Place Upgrade.